Well. I have been beavering away to relaunch my Luxury Gift Ideas site – those old-school followers may remember it in its first incarnation? 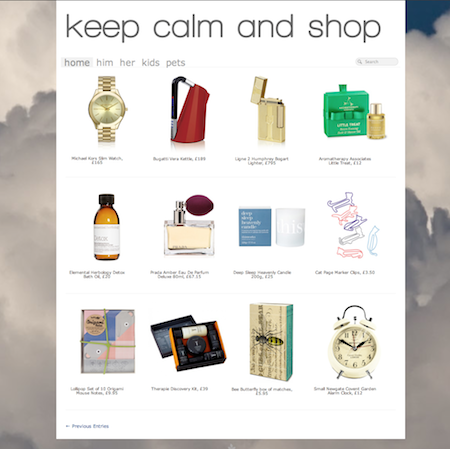 Yes, Dear Friends, I’m talking about Keep Calm and Shop! It’s back! You need never be stuck for a gift idea again – and, if you always get terrible presents from your loved ones, all you need do is forward them the link to Keep Calm! How does it work? Well, it’s just an “ideas store”. I find things that I love (the whole thing is basically one gigantic wishlist!) and then if you like the look of it you click the link to see further info and/or buy the item from whoever sells it. Remember it’s a luxury gift guide, so it’s all about things that are covetable and gorgeous. Window shopping at its most lush!